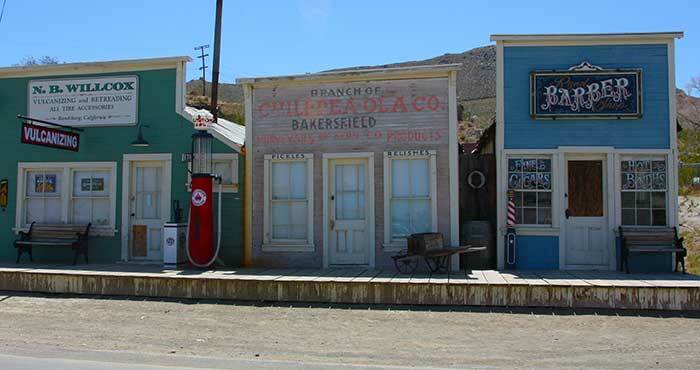 A visit to Randsburg, California is a visit to the past, when the mining camps of the Mojave were boomtowns and gold was being dug out of the hills. The community has survived the many perils the desert mining camps faced, and some of its residents still work the land for its hidden riches. 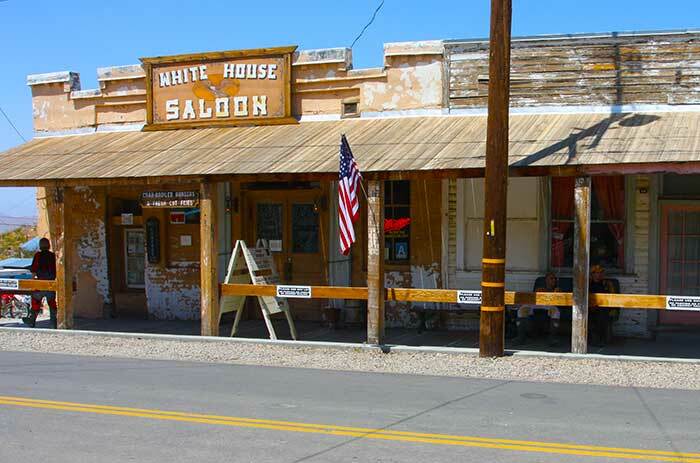 It is a living ghost town, a working mining town that likes having some -- but not too much -- company. There are no stoplights, gas stations or malls here; just an unpretentious, quiet little town that enjoys its place in desert history. Randsburg is located on the western Mojave Desert, near the El Paso Mountains and not far from Red Rock Canyon State Park. It's high desert- - around 3,500 feet. With nearby Red Mountain (formerly known as Osdick) and Johannesburg, Randsburg is a must-see for anyone interested in prospecting or the Mojave's fascinating history. The area is not only famous for mining gold, but also for mining silver and tungsten. In the late 1800s, the Rand Mountains hadn't been named yet. They'd been prospected a little, but passed over by most Rainbow Chasers. In the early '90s, three gold hunters discovered that one of the peaks in this small mountain range was a mountain of gold. These three prospectors -- John Singleton, F. M. Mooers and Charlie Burcham -- were down on their luck. They barely had enough food and supplies to keep them alive while they established their claim, and each day they used the gold they found to finance another day's digging. They were almost to the point of selling their claim to a developer when Rose Burcham, Charlie's wife, arrived and saved the day -- and their fortune. She wouldn't allow the sale, and found a way to finance the mine's development. To her husband and his partners, this was a woman who was worth far more than her weight in gold. The Yellow Aster became one of the biggest gold mines on the Mojave. The prospectors called their discovery the Rand. The town that sprung up became Rand Camp, then Randsburg. The mountains they were in became the Rand Mountains, and the owners changed the name of the mine to the Yellow Aster. The town and the area boomed. Soon over 2,500 people inhabited Randsburg making it a beehive of activity. Gold mines blossomed on the hillsides, and the boom was on. The boom faded, as they do around here; but the town would not die. Both silver and tungsten were discovered in the nearby hills, just as the area was beginning to die. Today, a few hundred hardy souls remain and keep the spirit of Randsburg alive. The town survives off a little mining, and a little tourism, as do the nearby communities of Red Mountain and Johannesburg. The heart of the town hasn't changed much since the first solid buildings went up. 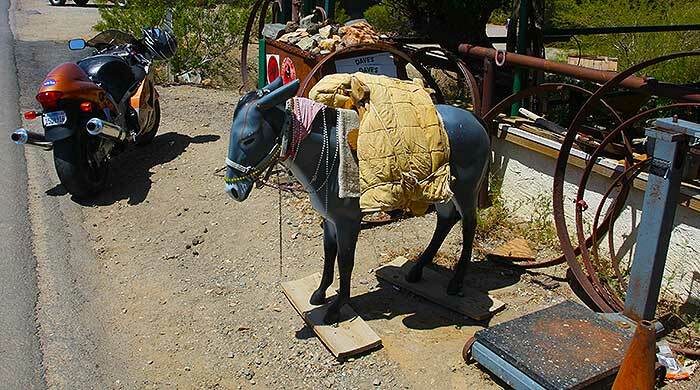 It's a little desert community built on the side of the mountain, a few strings of false-fronted buildings, lackadaisical sidewalks and collages of old cars, trucks and mining equipment. There isn't a straight street or right-angle corner in the entire town; built on the hillside, the roads meander with the lay of the land. History is important here. A museum, open only on weekends, houses a surprising amount of mining artifacts and memorabilia. The general store has a long counter and malt machines dating from the 1930s. There's a rack with treasure maps, books on hunting gold and locally-published histories, all great reading. There are a couple of good saloons still operating. Like the old days, here in Randsburg a good saloon is a lot more than a watering hole -- it's the heart of a community and a meeting place where business gets done, as well as socializing and problem-solving. The White House sits on the main drag (Butte Street), across from The Joint. The Joint is a Randsburg landmark. Olga has run the place since the 1950s, and her son took over the job after he retired from a government job in Visalia. Olga opened The Joint in the 1950s with her husband, who died in 1969. She ran the bar until she was 102 years old. The Joint has an old rock wall for a front, backed by whitewashed clapboard, and an old, old neon sign hanging from the false front. Inside, there are no pretensions; it's just a bar, with a few tables and a wooden floor that echoes every footstep. Along the wall are maps to rockhound sites and gold mines, as well as pictures and newspaper clippings from better days. The bar stretches along the left wall. It is dark, and cool, and the restrooms are down a tiny hall in the very back of the long, narrow building. Mining is still the number one topic in Randsburg. Not just gold; many local residents work at the 20 Mule Team Borax mine in Boron, or at the salt flats, or other mining operations on the western Mojave. Some still prospect, searching out the earth's treasures just as did the founders of this community a century ago. This living ghost town is a pleasant afternoon's stop, just off U.S. highway 395 about 20 miles south of Ridgecrest, California. It can also be reached from state highway 14 by taking the Redrock-Randsburg Road a few miles south of Red Rock State Park. There are motels in nearby Ridgecrest, Ca, with something for every taste and price range. For more information and a complete list, click here for rates, availability and reservations online. Also see Gem Trails of Southern California for a good book on rock hunting.